← Generation Two: Mon Dieu! When last we left off, Castor and Margot were getting ready to get hitched on the beach. As you can see, they’re now in the process of doing so. Again, some folks seem to have missed the “formal wear” memo… that or they got dressed in the dark. 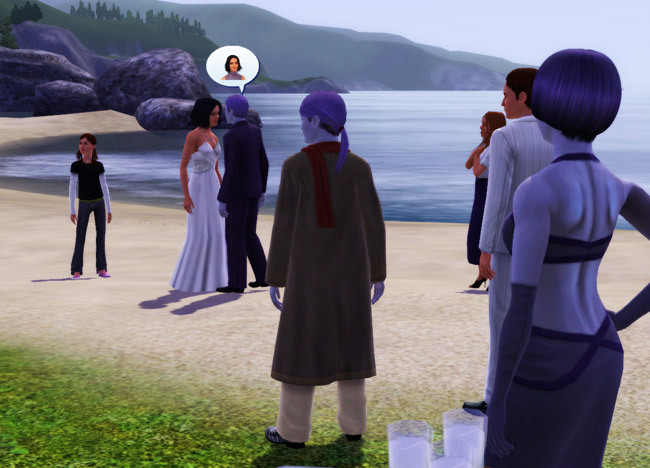 Strangely enough, this odd gaggle of wedding guests on the beach reminds me of my own wedding… only I’m not stumbling around in the sand. Obviously pretty wedding picture on the beach is obvious. I love the beach in Sunset Valley! I missed it so much. Screw you, Riverview–you’re buggy, incompletely, and sucky! Wow, you know, between Castor’s nose and Margot’s cheekbones… their babies are going to be mighty interesting looking. 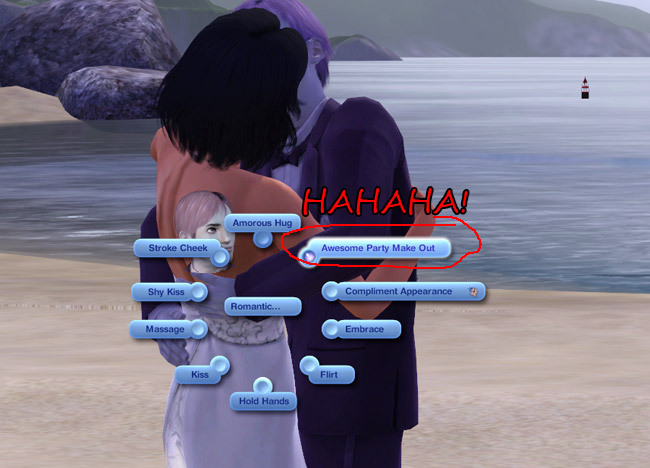 Not having had many Party Animals in my TS3 career, I was surprised to find that Castor had an option called ‘Awesome Party Make Out’. It’s just a standard make out, but it made me giggle profusely anyway. All I can imagine is someone yelling like a drunken frat boy, “AWESOME PARTY MAKE OUT… WOOOOO!” And so I had Castor do it at the end of the nuptials… snickersnicker. 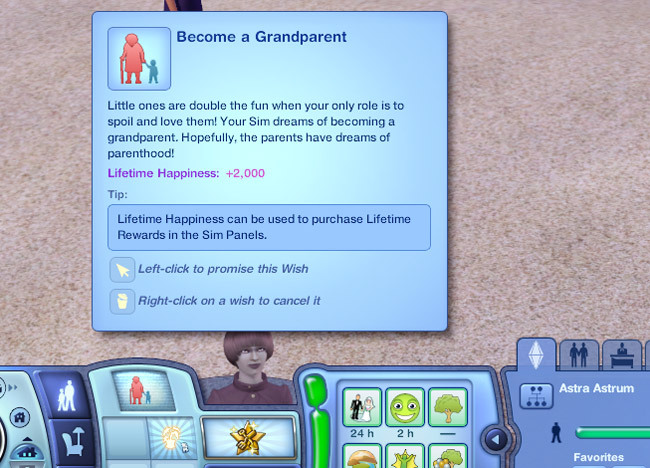 Of course, as soon as Castor and Margot finish up, both Astra and Christopher roll up wishes for grandchildren. Really, you two, is there no end? Well, yeah, but usually it takes a bit more time for these wishes to come up! Of course, the newlyweds aren’t the only ones being affectionate. Astra and Christopher are still all over one another, despite having zero chances of getting anymore kids. It’s kind of cute. I missed whatever Miss. Crazy Pants Diana was doing in the background that warranted so much attention. Probably just being her crazy self, as usual. Our blushing bride sneaks off to have a drink and maybe add a little more rose to her cheeks. Seriously, Margot? 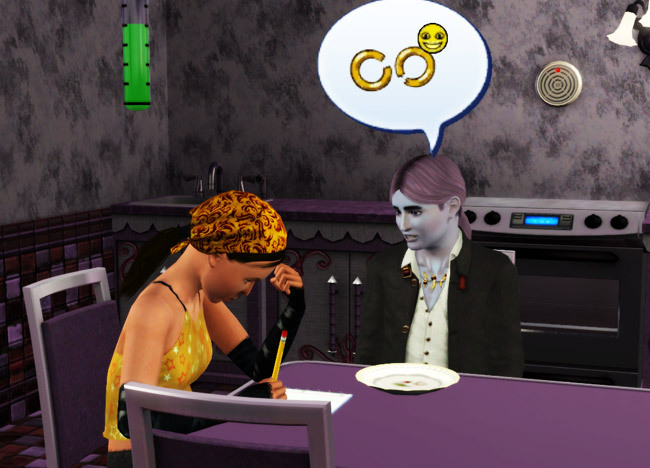 You’ve barely been married ten minutes and you’re already drinking! Oh, you’ll get used to it, trust me. Diana grows on you after awhile and you won’t have to worry about Jupiter much longer. Castor! What are you doing, talking to Manon? Didn’t we agree that she’s bad news? She doesn’t want to be friends, Castor. Look at her! She’s ten seconds from eating you alive. 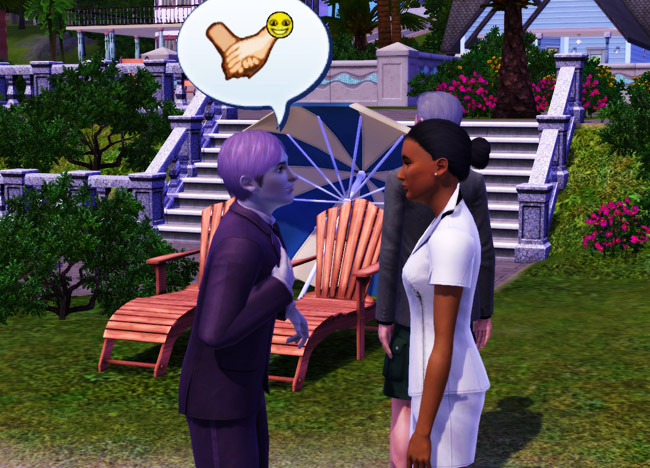 Of course, no sooner does Castor finish confessing his love for Margot and trying to be friends that Manon goes in for the kill. She tries to kiss him and he rebuffs her. Good Castor! She’s understandably upset. I’m not sure what’s gotten into her! She even got minus signs for Castor mentioning Margot. Sheesh! Good boy. Now don’t you guys have some consummating to do or something? Manon will be fine, I promise. Rearranging the house to fit two double beds wasn’t easy, but I did it. I actually worked on the house quite a bit throughout these pictures, so if you see things changing, that’s why. I made it considerably larger in an effort to handle all of these sims! It now boasts four bedrooms and an incomplete hallway, lol. Astra and Christopher become elders! Astra keeps her gloves but finds something a little less spacey and a bit more grandma. She looks so different without the purple hair. Christopher, of course, picks a ridiculous sweater/shirt combo that I let him keep. It just suits him. I’m realizing I don’t have enough perfect plants for Astra’s LTW. Aghhh, I hate planting LTWs! Uh huh, sure. Don’t you have a carpool to catch? You’re in Science now. Margot wanted to go into politics, so that’s her new job. Of course, she has no charisma so she’s immediately sent to the nearest mirror. What’s amusing about this picture is that it looks like Miss. Crazy Pants is mocking Margot. Actually, she’s just having a really in-depth conversation with the wall… because she’s crazy. No, she’s practicing her speech. That’s different. Oh, shush! Your insanity amuses me. Meanwhile, in the shiny new kitchen, Astra is smiling off into space. That’s kind of weird, actually. Why are you doing that? I guess that makes sense… generation three is close. Oh, I know. Think of it as a ‘gentle nudge’ that you’re going to be stuck with a baby soon. Better dig out that pregnancy book you found as a teenager! I catch Jupiter discussing something odd with Diana. LOL. Logic fail indeed. Once again, psychic link. My favorite pic is the labor one. They freak out more than Sims 2 sims! Ahh, you went there with the podium joke. Hahaha! That is too funny and OH YES I went there. I try to restrain my perverted comments, but there are some that are just too good to pass up! Haha, yeah there are some parts I really like about TS3, but it isn’t as big a deal as it was with TS2. LOL, it really does, doesn’t it? Sigh. I don’t know what to do about him. In heels too! Margot has mad skillz, yo! I’ve had that moving in want too, when they’re already moved in. 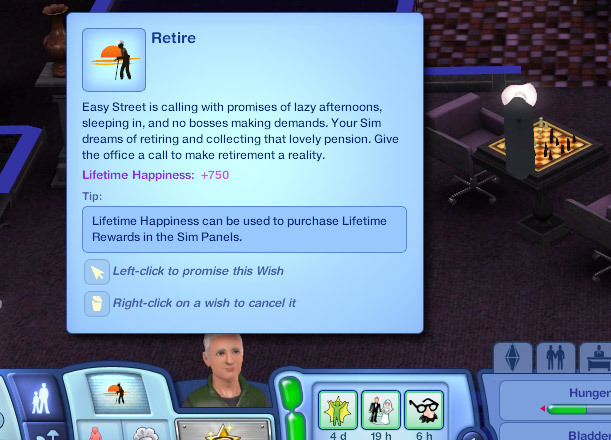 The dumb thing is that the one time I had it when the couple were not already moved in together, it didn’t even fulfill. FAAAAAAAIL! So is Miss Crazy Pants going to stay in the house now? I hope so. What kind of life could she really live on her own? LOL. I’m glad you got a blue baby! LOL, there are some many things in this game that perplex me! Definite logic fail. You know, I think I’ve had the same experience with that wish where I’ve tried to fulfill it and it’s just there, like, “what? You didn’t do nothin’ fool.” Sigh. Diana will remain in the house. She’s too crazy for me to abandon her to the life stream! *note to self: Don’t be eating while reading this blog. LOL. Diana even *looks* crazy with that face. Maybe it is the eyebrows, I dunno. But I hope you don’t kick her out. She’s definitely a blast! And yeah, I think all French locals come with the nectar making skill. She definitely projects crazy, LOL! That’s interesting, I’ll have to remember that.